Turmeric (Curcuma longa) is known as Haridra or Gauri in Sanskrit and alleviates kapha, vatha and pitta. Four varieties of turmeric are referred to by Sri Lankan Ayurveda doctors: the regular turmeric or kaha, the amba kaha (which smells like mango), val kaha (the jungle variety) and haran kaha. The rhizome and flowers are used as both medicine and food, says Lakshmi Senaratne, chief scientist at the Bandaranaike Memorial Ayurveda Research Institute. The rhizome is usually boiled, dried and cleaned. It is used in food because of its aroma, colour and taste. The herb enhances skin colour, heals ulcers and purifies the blood. It is therefore used in treatment of blood disorders, skin rashes and itching. A paste of turmeric, kumkum and white sandalwood is applied externally to give the skin a glow, usually applied before or during a bath. It is used traditionally in many beauty remedies. In India, raw turmeric juice (reddish-yellow liquid extracted from crushed fresh rhizome) is drunk, sometimes with honey, in the early morning on an empty stomach. It purifies the blood and is generally good for health. It reduces abdominal distention, increases appetite and gives a good motion. It also soothes gastric irritation, reduces blood cholesterol and purifies breast milk. It helps those passing sperm with urine. It is good for urinary disorders and oedema, anaemia, worms, sinusitis and glands around the neck. In conjunctivitis, it is used as a medicine to wash eyes or as eye drops. "We usually boil turmeric with other drugs for this purpose," Senaratne said. Turmeric corrects the functions of the liver. It is an antiseptic and purifier. This is why it is usually sprinkled outside homes, in temples and other establishments. For new cuts and wounds or leech bites, apply the juice of fresh turmeric. For swelling, to clean wounds, add colour to skin, for skin rashes and boils, apply fresh paste. 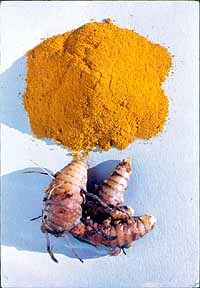 Senaratne said that the fumes of dry burning turmeric is inhaled for hiccups and by asthma and sinusitis sufferers. "The fumes also kills poisons," she explained. "It is usually inhaled in the night and the patient is not given any food for a few hours." For sore eyes, conjunctivitis, itching or pain in the eyes, crush raw turmeric and leave of kohomba, bundle it and foment the eyes. For infected ear accompanied by pain, put turmeric powder and sinakkaram into the ear but clean thoroughly afterwards. For skin rashes and ulcers, Senaratne recommends that a paste be made of turmeric powder and gingelly oil and applied to affected areas. For itching, skin rashes and infection, apply turmeric paste or turmeric and kohomba paste. For smallpox and chickenpox, apply the paste when the sufferer is in the recovery stages. "If applied when the scab is peeling off, it helps reduce scarring," Senaratne said. For cough, take turmeric powder with ghee. For colds, boil dried turmeric powder in cows milk and drink after adding sugar. For skin rashes, the powder is taken internally with cow urine. "Yes, people drink it," said Senaratne. For those who has an increased blood e-count, take turmeric powder or juice with one teaspoon of bees honey. For filaria, take powder with cow urine and jaggery. According to Indias Jiva Institute, one teaspoon of turmeric juice taken daily with honey cures anaemia. For asthma, boil one cup of milk with one teaspoon of turmeric powder and drink while warm. It also speaks of burns: mix one teaspoon of turmeric with one teaspoon of aloe gel and apply. For conjunctivitis, mix one tablespoon of crushed, raw turmeric in 1/3 cup of water. Boil and sieve. Two to three drops of this mixture may be used in each eye up to three times a day. To enhance complexion, Jiva Institute suggests that a paste of turmeric be applied on the skin before bed and washed off after a few minutes. In the morning, remove remaining yellow tinge with a paste of chickpea flour and oil. For dental problems, mix turmeric with salt, add mustard oil to make a paste and rub on teeth and gums, twice daily. For pain, the institute suggests that one teaspoon of turmeric and two teaspoons of ginger be mixed with water to make a paste. Spread over a cloth, place on affected area and bandage. Or, add one teaspoon of turmeric to one cup of warm milk and drink before bed. According to the institute, burning turmeric can repel insects while inhaling the smoke can assist in coughs, asthma and congested nasal passages. The root of the turmeric plant is useful in a dry cough. Roast and powder the root and take in three-gramme dozes twice a day, morning and evening.